It’s our human dilemma. Our parents, teachers, ministers, villages, experiences all teach us valuable lessons about what to do in certain situations. Over time these lessons define us. They become our “Roles” in life. Locked in stone. Unchangeable. But are they? 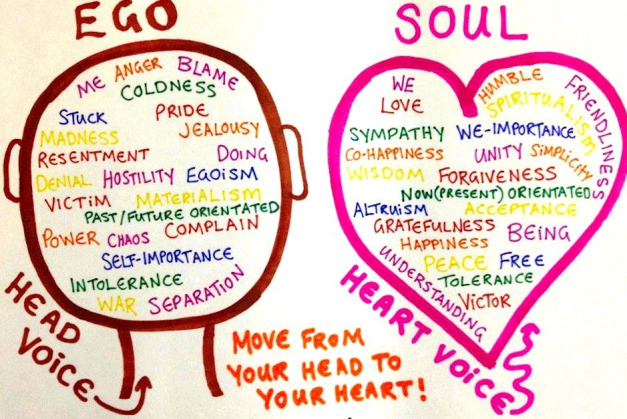 Can we move out of the Role and into the Soul? I write constantly about how we operate in one of two interactive states. We’re either operating from our Knower/Judger persona (interacting with our environment based on past experiences and feelings) or our Learner/Researcher persona (accepting new data without judgment and feeling comfortable about what we want). I’ve frequently named these states our Role and our Soul. Our K/J or Role persona is what pops out on our DISC or Myers-Briggs (or any other) predictive behavior assessment. These assessments are frequently used to help organizations understand “where you’re coming from” in terms of predicting your behavior and reactions. Your DISC profile, for example, will tell us what degree of Dominance, Influence, Compliance, and Sensitivity you’ll use with teammates. A high “D” will take charge. A high “I” will tend to tell you what you want to hear. A high “C” will almost always color between the lines (and want you to do the same), and a high “S” will be the peacemaker. But these profiles only define our roles in society. The lessons we’ve learned from past experiences and feelings condition us to repeat certain behaviors over and over again until they actually define us. In classic psych jargon, it’s operant conditioning. We’ve been positively reinforced for certain behaviors and negatively reinforced for others. An actor’s part in a play, movie, etc. The function assumed or part played by a person or thing in a particular situation. Do you yearn to ditch some of the Role behaviors you’re known for? Your direct reports fear you and so won’t contribute ideas and creativity in the workplace. You can sell ice to Inuit, but you’re not sure if your customers (or friends, or lovers) are buying because they want to or because you’re just that damned good. You’re a peacemaker, and after doing it at home in the morning, all day at work, and all evening before bed, you’re just exhausted. These are all shout-outs from your Soul. They come from that part of you that can actually see the data for what it is and wants change. But alas. That Role can be too powerful. And you do what you’ve always done. Still getting what you’ve always gotten. The piece of the Soul I want the reader to remember is the part that wants. Athletic coaches are always declaring that the team won or lost because they wanted it more, or didn’t want it enough. I totally believe that. Take the Baltimore Ravens in Super Bowl XLVII. Underdogs in both rounds of the playoffs and the Super Bowl, luck just seemed to flop their way. I see evidence of this every day. At a recent rally in Michigan, Canadian privateer Antoine L’Estage overcame an eight-second deficit in the last two stages to beat current American champ (and Subaru-backed) David Higgins by six seconds. Who wanted it more? I bet you have stories of overcoming odds when the want piece of your Soul has kicked in. I just want the clear data part of your Soul to see that it happens. That it can happen. And that it can happen as often as you want it to. Now apply that to your Role issues. When your Role is telling you to do what you’ve always done, can you insert your Soul in Frankel’s space? Ask yourself “Is this producing what my Soul wants?” and choose your response. Your life will change—if your Soul wants it to enough. Excellent, Kim. Much wisdom in those words. I feel as though some people are trapped in their roles in life; they do not recognize their role in keeping themselves trapped. It’s funny, but the whole “trapped” dynamic seems to overshadow and “protect” all the parts of the roles. Let go of that and there’s no stopping you.